Princess Anne Volunteer Fire Company – Mission : To serve the people of Princess Anne, Maryland and all nearby communities within its fire district, to the best of our ability, by responding to all alarms of fire, rescue, and medical emergency, protecting life and preserving property, and educating the public with the modern methods of fire prevention. 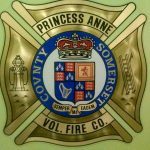 Welcome to Princess Anne Volunteer Fire Company’s website. Our company serves the northern portion of Somerset County, Maryland . We provide Fire , Rescue and EMS services to our citizens from one station located in the historic downtown area of Princess Anne. We have been designated as “Station 5” by the Somerset County Volunteer Fireman’s Association. Present staffing includes volunteers and a paid EMS crew providing advanced life support supplemented by the volunteers. Billy Merrill is the Chief and Jerry Holbrook is the President of the department .